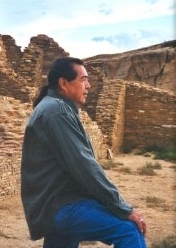 Dennison was born near Klagetoh, Arizona on the Navajo Indian Reservation. His grandparents played a major role in his upbringing, and he credits them as the major influence on his life and his art. Both grandparents taught him a deep spirituality and respect for Mother Earth. These values are reflected in all aspects of his life and art. His grandfather was a silversmith and it was from him that Dennison learned his trade. At the young age of 8 years, he began manning the bellows of his Grandfather’s crude forge, to melt the silver that was to be poured into sandcast molds. Under the expert guidance of his grandfather, he slowly learned the art of silversmithing. By the young age of 10 years, Dennison was already making jewelry. He has continued to make jewelry from that time, learning new techniques and refining his skills along the way. Dennison’s grandmother was a renowned rug weaver, and it was from her that he learned a keen sense of design. He also learned patience and the importance of paying attention to detail, as all are requirements of creating high quality jewelry. In grade school, art was a favorite subject. He found that drawing and painting came naturally. Although he was mostly self-taught, by his early teens Dennison was helping his family financially with the sale of his artwork. He continued painting and making jewelry on a part-time basis over the next several years. He participated in many shows, and displayed his work in galleries throughout Arizona. In 1988 Dennison started his own business, The Navajo Silversmith. This allowed him to create and sell his jewelry and artwork on a full-time basis. Building on his heritage, he has gone beyond tradition to create new and unique designs, incorporating gold, silver and copper as well as a wide range of beautiful stones into his jewelry pieces. Copyright © 2011 The Navajo Silversmith -All rights reserved. No images or designs may be copied without written permission. IP addresses are logged.